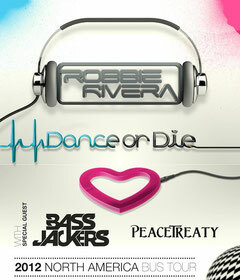 DJ/producer Robbie Rivera announced the May 7th release of his fourth album, ‘Dance Or Die’ and a 24 show U.S. bus tour. Robbie will start his US tour following his annual Juicy Beach Miami at electronic dance music's biggest US event, Miami Music Week. Commencing March 28th and ending on May 4th, this 24 show tour is a massive pre-party for what's expected to be the biggest Robbie Rivera release of his career. The ‘Dance Or Die’ album consists of Robbie's best releases over the past year with a bunch of new tracks and features a multitude of collaborations with some of the biggest forces in dance music, including Wynter Gordon, Tommy Lee & DJ Aero, David Solano and more. Singles on the album include the progressive ‘Roxy’, which hit #4 on Beatport's top 10 chart, ‘Turn It Down’, which was rated #5 on MTV Buzzworthy's list of 5 Must Hear Pop Songs of the Week, and the electro jam ‘Makes Me Feel Good’, which peaked at #8 on Beatport's Electro House chart. The album will be released on May 7th via Black Hole Recordings. Robbie Rivera: "This album is my best work to date. I started it in my Ibiza studio in the summer of 2011 and finished it in Miami. I have tried and tested every tune to make sure it rocked the dance floor. Mission accomplished!" The ‘Dance Or Die’ tour is set to be an energetic, intimate, and captivating portrayal of Robbie's exciting career producing and performing house music combined with a love for the young/energetic wave that's consumed EDM in the States today. Joining Robbie on his tour is the duo from Amsterdam, Bassjackers and the up and coming big room house producers, Peace Treaty. Tickets for the ‘Dance Or Die’ are on sale now at danceordie.wantickets.com. Read your blog,i know the more Knowledge，you topic is very good，like your writing style.This is my first visit to your site.I was love in it. I've found your blog via Yahoo and Im really glad about the information you provide in your posts.I have a question to ask what the future will come back. Very nice post. I just recently started reading your article,All of the projects look great! You make it so simple to this.Your blog writes is good!Thanks!